this essentially tells spweb.sp.local is the mail server for the domain of sp.local or subdomain moss.sp.local. read here for more details. check "yes" on "Save original e-mail"
7. Configure an email client (outlook). install SMTP extension (pop3). This is a necessary (and hard) part since Win2k8 doesn't have POP3 built in. 8) Test first if sending and receiving email work okay in outlook by sending some email to itself, and then test sending email to a sharepoint list such as shareddoc@moss.sp.local. 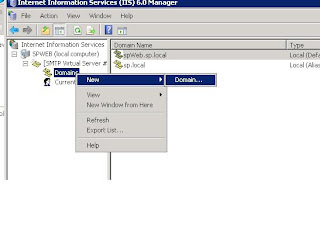 Overall, the very simiplied picuture is: mail client asks its local SMTP to send an eamil to shareddoc@moss.sp.local)-> outlook's local SMTP server ask DNS,who is mail server for remote domain sp.local ? -> find MX record from DNS ->logon to remote mail server SMTP-> check for mail domain moss.sp.local: if it doesn't exisit, mail sending fails there. If it does exist, mail goes to SMTP's drop folder and stay there waiting for SharePoint Timer Job to pick up and put into the assocaited list. For regular user email, mail client using POP3 will do the pickup job, and the only difference is regular user email has its individual subfolder under the drop folder root.